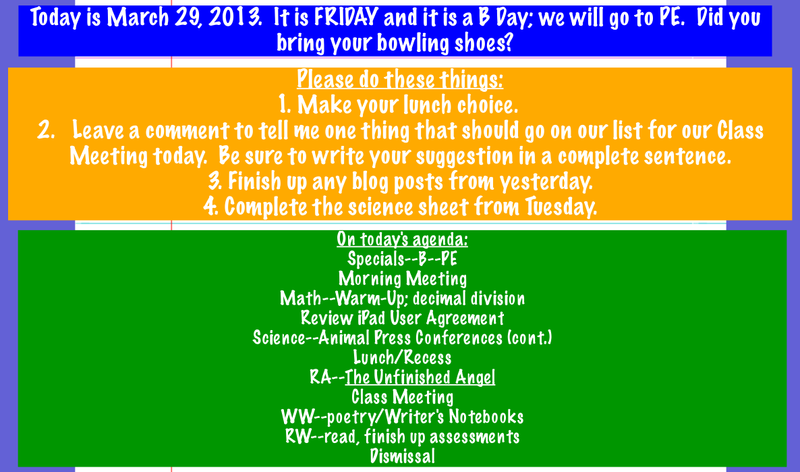 Image • Posted on March 29, 2013 by Jen Bearden	• This entry was posted in Classroom. Bookmark the permalink. I think that we should talk about kickball today. I think we should write down the IPad minis because they are new and everybody was really excited about them. I think we should talk about kickball. 1. Liked- I liked our science projects because we get to work with our friends, and make up an undiscovered animal. 2. Learned from- the iPad minis, because we all learned how to set up a iCloud account. 3. Need to talk about- Basketball (kind of), because we would be playing a game, and to totally random people would join in. Crazy! We should put IPads on our list , We should talk about what to do and what not to do. I think we should talk about iPads, and how awesome they are. I think we should talk more about kickball because I think the whole basketball thing was solved. I think we should talk IPad min’s to because a lot of people still have guestions. First of all, we are having more trouble with kickball, so I’d like to talk about that. I think we should talk about recess because there is a lot of problems going on. We are having a lot of problems. I think we should Talk about Read Aloud because It is fun to listen to! !! I think we sould talk about we read more books then last year. Also I think we should talk about ipads, and howncool they are.